And so it has come to pass as the threat to go it alone if Congress did NOT bow to his will has begun. With this week’s Senate passage of the ‘Farm Bill’ and now via Executive Order, Barack HUSSEIN Obama has created seven regional ‘so-called’ climate hubs claiming they will help farmers and rural communities respond more successfully to the risks and effects of climate change…including drought, invasive pests, climate related wildfires, and floods. However, climate change…with the left’s bloviations about ‘so-called’ global warming being caused by carbon emissions and greenhouses gasses that Obama and his cronies keep hawking as our possible downfall…is pure nonsense…pure unscientific nonsense…period. Ever since the Earth was formed…4.54+ billion years ago…it has gone through natural cycles of warming and cooling…the key word being ‘natural…with visual evidence of this being seen in the stratigraphic record of the Earth’s rocks. These warming and cooling cycles…climate variations (‘weather’ as some like to call it)…have happened from Earth’s day one and will continue until the Earth is NO more…with or without man’s hand in it. Cut all carbon emissions…ban whatever… control population centers…these cycles will still happen as these naturally occurring climate variations occur NOT because of ‘so-called’ greenhouse gasses or carbon emissions, but because of variations in the amount of solar energy (as in solar flares) reaching the Earth, and NOTHING man does or does NOT do will stop this. 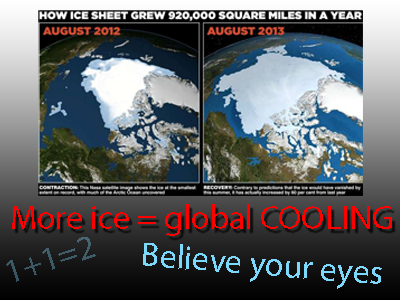 And all those crying wolf right now…as in Al Gore and his groupies…are dealing in pure unadulterated scare tactics as the Earth is in fact heading into the next ‘Little Ice Age’ NOT into a period of global warming. Major solar events…as in the recent intensity in cyclic solar flare activity…are caused by an increase in the energy radiating from within the sun itself…and that radiating energy that reaches the Earth is what is responsible for what some say is global warming caused by man. 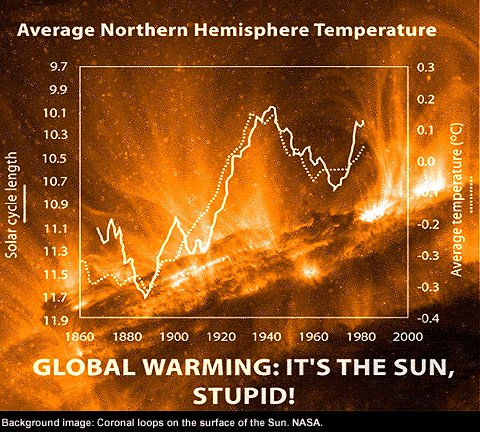 But the truth is that the solar activity itself is the main factor responsible for causing climate variations here on Earth NOT carbon emissions and NOT greenhouse gasses. And as solar flares are now in a waning cycle (a naturally occurring waning cycle), Earth has started on a temperature drop even though developing countries are still spewing out and even increasing carbon emissions. And this temperature drop will continue until the next naturally occurring cycle of radiating solar energy begins…as in a few hundred years from now according to true science-based climatologists. And so a ‘Little Ice Age’ is what we should be preparing for as that is much more dangerous than any period of so-called global warming could ever be, and Obama and his buddies better realize that before it hits home…and before it’s too late. So as Obama tries to scare everyone with fears of drought, invasive pests, climate related wildfires, and floods caused by ‘supposed’ global warming, what he really needs to worry about is the effects of the burgeoning ‘Little Ice Age’…as in shortened growing seasons, more energy needed to stay warm, and food shortages which could lead to breakouts of regional conflicts and possible wars. And as Barack HUSSEIN Obama has now, in his self-anointed role as king of us all, issued a ruling on climate change…on global warming that is NOT happening… he is doing so without scientific fact to back him up and without action from Congress. This creating of seven climate hubs is a major part of Obama’s goal to dictate climate policy through Executive Orders alone. And this most dangerous of Executive Orders was done solely to build political support for his more devious plan…as in his plan to control the Environmental Protection Agency’s (E.P.A.) regulations on coal-fired power plants. The E.P.A. is now in the process of drafting regulations that will limit carbon pollution from coal-fired power plants…regulations which will eventually cause the shutdown of hundreds of plants around the country…putting thousands if NOT hundreds of thousands of people out of work. And while Obama knows he will rightfully get major flack from the coal industry over this, he simply just does NOT care as his objective is to make us even more beholden to his muslim brethren for oil, with the added bonus for him being that this action will then force those now without a job onto the government welfare rolls for their very survival…thus creating even more people beholden to the government… creating more people who dare NOT bite the hand that feeds them…and creating more people who especially dare NOT do so come the mid-term elections or they stand a good chance of being completely cut off. Clever man…vile, evil, clever man that is.